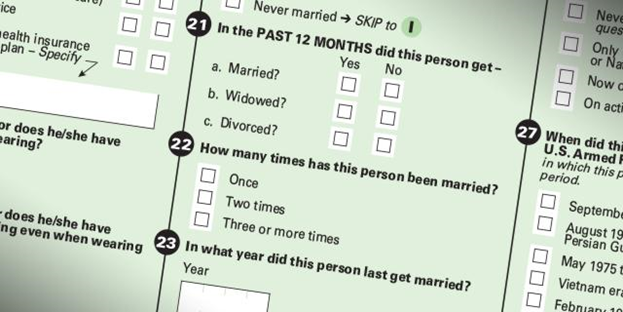 The Census Bureau will keep marital history questions—but what’s next? When the Census Bureau announced its recommendation to keep marital history questions in the American Community Survey (ACS) after soliciting comments from the public for 90 days, you may have assumed that demographers everywhere were relieved. And why not? Their retention in the ACS was a major victory for, well, everyone: academics, journalists, statisticians, policy analysts, and anyone with a stake in the history of the two largest program in the federal government, Social Security and Medicare. But there was troubling news hidden in this announcement: the Bureau’s “deeply flawed” method for evaluating questions is still in place.